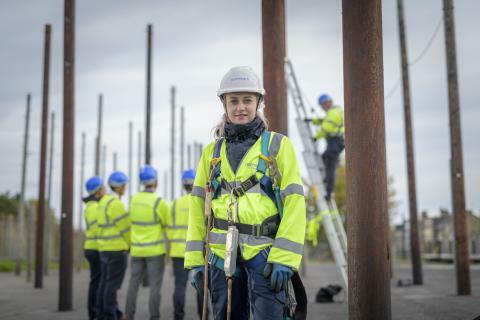 More than 220 trainee engineers will be hired across Scotland as part of a huge recruitment drive announced today by Openreach. The new roles – in locations throughout Scotland from Shetland to Dumfries and Galloway – will see trainees join the UK’s largest team of telecoms experts working to expand, upgrade, maintain and install services over Openreach’s national broadband network. The total includes 48 posts for the Glasgow city region, 38 for Edinburgh and the Lothians and 34 for Aberdeen city and shire as well as new posts in locations like Highlands & Islands, Dumfries & Galloway, Stirling, Ayrshire and Perth & Kinross. Across the UK, more than 3,000ii trainee engineers are being recruited. Around half will be helping to deliver the company’s ‘Fibre First’ programme, which is bringing faster, more reliable and future proof Fibre to the Premises (FTTP) technology to millions of front doors. Alongside the latest recruitment drive, Openreach is also announcing it will be building new FTTP networks in the Greater Glasgow area during 2019. This brings the total number of towns, cities and boroughs at the forefront of the FTTP build to 25, with the company on track to deliver its commitment of reaching three million homes and businesses with ‘full fibre’ broadband by the end of 2020. Clive Selley, Chief Executive of Openreach, said: “Openreach is ambitious for the UK and is determined to build full fibre as quickly as possible to ensure the country has a reliable broadband network capable of supporting future data-hungry services and applications essential for boosting productivity and sustaining our position as a leading digital economy. In addition to parts of Greater Glasgow, the other locations where Openreach will be building FTTP networks during 2019 iii are Bury, Barking & Dagenham, Bexley, Croydon, Harrow, Merton, Redbridge, Richmond upon Thames, Sutton Coldfield and Salford, with the company on-track to deliver its commitment of reaching three million homes and businesses with ‘full fibre’ broadband by the end of 2020. For the first time, Openreach also plans to publish details on its website detailing its build plans for the next 12 months, including the total number of exchange areas to be reached in each location. The company will update this information every three months. Fraser Rowberry, Openreach’s service director for Scotland, said: “We want people from all walks of life to apply for roles at Openreach, to build a diverse workforce that reflects the hugely diverse communities we serve. “Becoming an engineer can be an incredibly rewarding career, and we’re constantly improving our training and recruitment programmes, providing recognised qualifications, to make sure we attract and keep the best in the business. We’re investing heavily in upskilling our people, so they can now do more for customers in a single visit, and we recently launched new career pathways to give our engineers a clear sense of the skills, accountabilities and experience they need to get where they want to be. The new Peterborough training school is one of 12 centres being built or upgraded across the UK and is the second to become fully operational under Openreach’s investment plans. 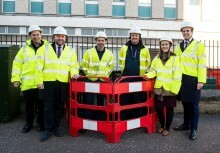 An investment of £450,000 in Openreach’s Scottish training centre in Livingston will be unveiled later this year. i Fibre to the premises (FTTP) or ‘full fibre’ broadband connections can deliver download speeds of up to 1Gigabit per second (Gps) - enough bandwidth for a family of four to all stream ultra HD or 4k quality movies or TV simultaneously, without interruptions, waiting or buffering. Downloading a typical HD film would take less time than it takes to make a cup of tea. ii Of the 3,000 roles, around 1,600 are newly created roles having taken account of attrition (e.g. retirement). Openreach is creating fibre training centres across the UK in Bradford, Bolton, Crawley, Exeter, Livingston, Newport, Nursling, Peterborough, Romford, Thornaby, Yarnfield and Northern Ireland. Downloading a film and sharing or streaming content is about to become faster and more reliable for more than 30,000 homes and businesses in Hamilton. People living in the South Lanarkshire town are set to benefit from access to some of the fastest broadband speeds available (up to 330 Mbps), after Openreach announced the next 81 locations to be upgraded for ultrafast broadband.